Drought is a prolonged period of dryness that causes damage to the vegetations and prevents them from growing successfully. If you have been in California I guess you have ever experienced or have ever heard of the prolonged drought that destroyed many trees there. Trees have been the major victims of prolonged drought in California. This is because the excessive water they lose during transpiration is far much more than which they absorb from the soil. Your trees are very important because they significantly contribute to the beauty of your compound. They also provide shade that makes it comfortable for you to sit under trees on hot days. You also get some fruits from your trees hence you should take great care of your trees. Your way tree service Inc offers tree trimming services that can assist you in taking care of your trees during drought periods. There are some measures that you can take to prevent excessive damage of your tress during the California drought. One of the ways is coming up with measure that can minimize the amount of water your tree is losing through transpiration. The easiest way of minimizing transpiration is through minimizing the leaves of a tree by cutting off some branches. The efficient way of cutting your branches is through tree trimming services. 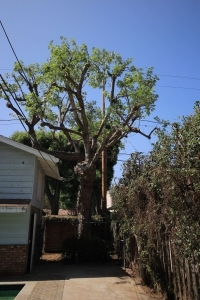 Your way tree service Inc has been offering tree pruning services in California for many years. Tree pruning will remove the damaged branches of your trees. The removed branches will minimize the amount of water the trees were losing through transpiration. This will minimize the suffering of your trees during the drought. At Your way tree Inc we have a team of highly qualified professionals in tree trimming. Our staffs have been trained on handling trimming involving any kind of trees. They have many years of experience in tree trimming hence they understand well how to carry out the trimming in an effective manner. We have an insurance cover of workmen’s compensation. You should therefore not worry due to the damage of your properties. In case of any damage you are assured of being compensated. You should also not worry what will happen in case of any of our equipments is damaged when we are in your site. All of this will be taken care of by the insurance company. We always sterilize our equipments before and after every work. This is meant to prevent disease infections to your tree. Often trees suffering drought are prone to invasion by insects and diseases which weakens your trees. Through tree pruning the insect nests will be destroyed hence creating uncondusive environment for the pests and other insects that damage trees. We also spray and inject trees so as to control infestation and disease problem. Our professionals will advice you on how frequently you are supposed to be pruning the trees so as to ensure the insects do not settle on your tree and damage it completely. We guarantee you primary attention to the Safety of your property and our employees. Our employees will ensure they take maximum care of your property to avoid any damage. If we make any mistake we always admit it and fix it. Contact us at Your Way tree service Inc at anytime you are in need of our services.